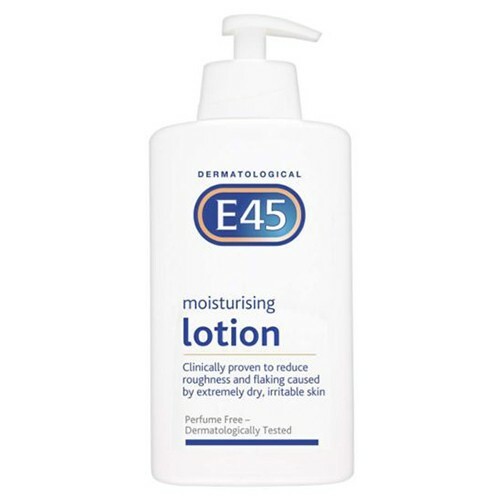 E45 Moisturising Lotion (Pump Bottle) is a soothing moisturising cream designed for daily use on the hands body and face. This handy pump bottle makes the cream easy to dispense and suitable for use over the whole body. The gentle perfume free formula helps to maintain the skin's natural moisture levels and prevent dryness occurring. E45 can help alleviate discomfort and itching from dry rough and sore patches of skin. It is also suitable for use on serious dry skin conditions like eczema and dermatitis. E45 contains Medilan a special purified version of lanolin which is a powerful moisturiser. The cream is dermatologically tested and allergy screen for sensitive skin. Daily use will help keep skin soft smooth and supple.